Often a search for DIY Window Well Cover is initiated when someone has been disheartened by the options seemingly available to them. Either the well covers are too expensive or the timeline is too long. Purchasing a custom window well cover can take weeks to measure, fabricate and install. Additionally, these custom covers often carry a hefty price tag as there are labor costs associated with custom work and installation. Certainly, if you build your own window well cover you would save money and shave time off the custom grate’s 2-3 week timeline, right? Perhaps you will, but before you head to the hardware store for your DIY window well cover materials, consider a few things about your design. Quality plans are hard to come by on the internet, as many DIY window well covers are the results of trial and error by the DIYer. What works for one homeowner’s well shape, security needs, family safety, and skill level may not meet the needs of another. Municipalities can also play a factor as they may have requirements about the amount of weight a cover needs to support or materials they approve of depending on the location of your well. Something you will want to investigate before you commit to your materials. One of the reasons that people seek to cover their window well is the fear that a large open hole in their yard is hazardous – it is. However, the potential for someone or something to fall into the well isn’t always mitigated with a DIY window well cover. Covers made of plastic will break down over time due to the sun’s powerful ultraviolet light. Even the thickest plastics will eventually become brittle and break down. Should a child, pet, or friend stand on the cover (even if by accident) after it has aged in the sun, there is no guarantee the cover will continue to perform as it once did upon the initial build. The appearance of the cover on the window well then begins to offer a false sense of security. Covers made with lumber don’t always fair much better. Wood can become just as brittle and weak exposed to the elements without periodic maintenance. The weight of lumber can also become a concern, but we’ll cover that more in a minute. Covers made of mesh netting, wire, or screen may seem like a good option to keep debris and animals out. However, these materials are not an ideal design to support any type of weight. Should someone ever trip and fall into the well, you may still be liable. If this material is important to you, you’re better off adding these to a grate designed to support weight for maximum safety. When it comes to safety, it’s not only above the window well you need to consider. Window wells are an emergency egress from your home. Permanently attaching a cover to egress wells is a code violation in many cases. In an emergency, you don’t have the time or sometimes even the ability to be locating tools and a flashlight to be able to escape your home safely. Decide how your DIY window well cover should open for egress. Having a plan for how the cover will function from the underside is just as important as its function from above. International Residential Code (IRC) specifies that devices used to cover emergency escape and rescue openings are required to be releasable or removable from the inside without the use of a key or tool (Section R310). You also want to avoid anything that would require special knowledge like a code or combination (Section R311). Emergencies rarely happen in perfect circumstances; can you open the cover without lights/power in the middle of the night? Will you need a window well escape ladder? Deep window wells can be tricky to climb out of without one. Keep in mind, anything that prevents or hinders you or your family from exiting the well is hazardous. Weight is a double-edged sword when it comes to your DIY window well cover. You will need a design that is light enough to push off during an emergency, yet something with enough weight that won’t whip right off in the wind. Some designs, based on how they fit the well, are susceptible to taking off in the wind. Exposed surface areas can make it possible for the wind to move the cover rendering it useless. Window well covers made of lumber typically have enough weight to stay put in a storm. However, the weight of the lumber materials can become too heavy to easily remove from underneath in an emergency. You may want to secure the DIY window well cover the well permanently to keep the wind damage minimal. This is ill-advised. Remember, you need quick and easy egress from these window wells. Part of the joy of having window wells in your basement is the natural light they allow into your basement. This makes your basement feel like a natural extension of your home, rather than a cold, and dark dungeon-esk room. Many times, DIY Window Well Cover plans will encourage you to keep natural light a priority, rightfully so. Plans that opt for the use of translucent plastic, wire, or lattice-like materials are in an attempt to protect your natural light. However, these designs can be doing so at the expense of safety as previously mentioned. Even clear solid covers can potentially rob you of light, see the article here to learn more. 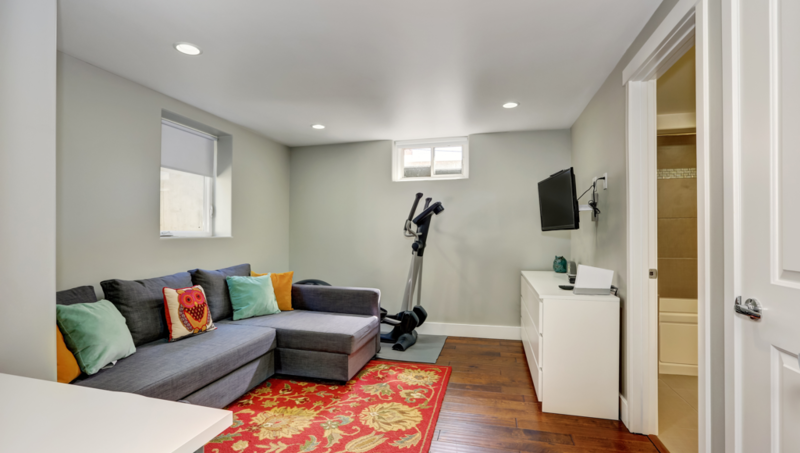 DIY window well covers made of lumber can block significant amounts of light, which can impact the livability and enjoyment of your basement. A DIY window well cover is an investment just like any cover. You’re investing in materials as well as your time to design, fabricate, and install the cover. Consider the total investment you are making in the cover and the continued investment you will need to make with upkeep and periodic replacements of this cover. Are you sacrificing natural light or your family’s safety? Do you have the tools available to execute your design? Adjust-A-Grates were designed specifically to be a do-it-yourself option compared to expensive custom window well covers. We started in ornamental iron, and faced the same design questions of how to build a better window well cover. We are proud to offer a solution that doesn’t require the long timeline or high price tag of custom covers. Our patented design allows the homeowner to easily install the correct model for your well on your own. You don’t need special tools, drilling, or engineering experience. 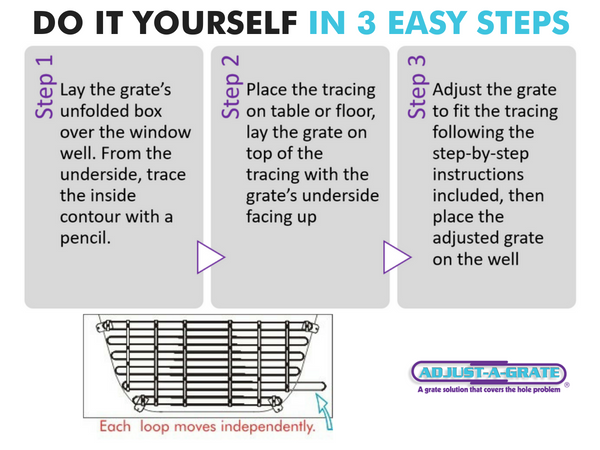 Following our step-by-step instructions, the grates deliver a custom fit solution. Additionally, you can purchase these grates and install in less than a week (depending on where you are located). Colorado customers can purchase and install the same day in many cases. Manufactured of high quality tempered aluminum, Adjust-A-Grates are lightweight enough to push off in an emergency, yet can support up to 400 lbs of static weight. The grate allows full ventilation to your basement and 90% of natural light. We also offer an optional Security Kit with quick release if you’re interested in added security. Best of all, Adjust-A-Grates are designed to last a lifetime, they will never rust or require painting. Your one-time investment in the grate and time to install is all it takes. No ongoing maintenance or periodic replacements required. To learn which model of grate is right for your wells, visit the product information page here.